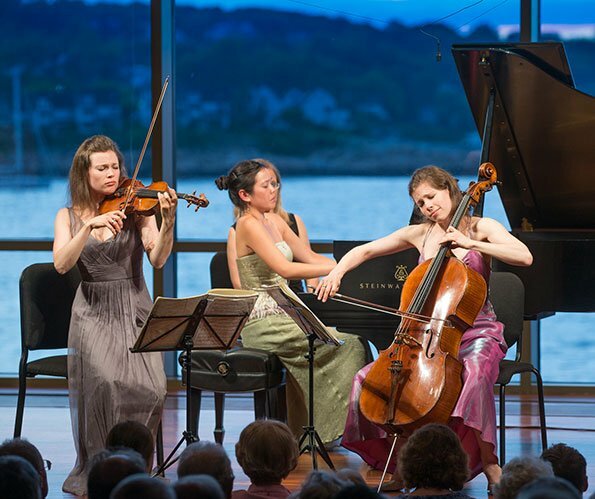 Gracing the Shalin Liu Performance Center for the fourth year in a row, as part of the 33rd annual Rockport Chamber Music Festival, the Claremont Trio took the stage with gentle smiles as the setting sun spilled over the clouds and the undulating waves. Beginning with Beethoven’s 1st Piano Trio, Opus 1 No. 1, and what better place to begin, I immediately sensed clear and purposeful interpretation. While the trio’s joy and carefully calibrated restraint captivated me at first, the tightness and precision blew me away. 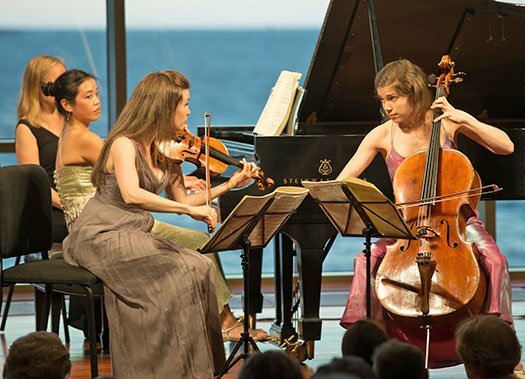 Youthful appearances belied the effortless unity that has come from performing as an ensemble for almost 15 years. Written shortly after Beethoven’s move to Vienna at the age of 22, his initial opus naturally lacked the torment of his later works, but it nevertheless gave ample scope to Emily Bruskin’s violin tone—focused but not too intense, breathy but still clear. Her sister, Julia, matched startlingly well on the cello. However, before the second time through the first movement’s exposition, the emotive gestures of the Bruskin sisters began to pull me out of the music. They weren’t overly gaudy or prideful, but their knowing glances to the audience and mischievous eyebrow raisings would perhaps have been better suited to the dry wit of Haydn. Their shrugging shoulders and wide smiles were too readily displayed, often implying a sort of interest and intrigue during sections of mere accompaniment. Though their movements were ostensibly natural and genuine, they didn’t help me connect with the Beethoven. Drawing from her South American ancestry, Frank took a page out of Bela Bartok’s book and synthesized traditional melodic sounds and forms with contemporary classical aesthetic conventions and explorations. The piece featured lots parallel harmonies, closely voiced dissonances, and a marvelous variety of textures and emotional content. “Folk Songs for Piano Trio” did not feel especially avant garde; in fact I found it rather reverential for the early-to-mid 20th century ethos. However, the composer’s combination of her own family history with this style makes it something unique and fresh—never mind that it also shows fine craftsmanship. By the second movement, I had a greater appreciation of the Bruskin sisters’ physicality. Perhaps this piece took more attention, or perhaps they connected with it more, but their more restrained demonstrativeness dovetailed with the music more naturally. The third movement featured some interesting techniques: the strings strummed their instruments like guitars, playing full chords using their thumbs and both sides of their fingers. Over this framework, the Andrea Lam’s piano rose with delicate sensitivity and mysterious melodic content that felt like something out of Isaac Albeniz’s piano work, giving way to a last movement with long stretches of intensity. Brahms Piano Trio in B Major, Op. 8, composed in 1854 and revised in 1889 had the energy of a vivacious, young composer, but the organization of a mature, 56-year-old master. I listened to most of this piece with my eyes closed; the music was so passionately and perfectly rendered, though a few times I did open my eyes, at particularly virtuosic sections of the music, just to watch. As the violin was soaring in its high register through this dramatic music, Emily was, quite literally, soaring out of her seat—nearly standing up. Nonetheless, I felt in this piece that these performers had the right to do whatever they wanted on stage, so magical was their performance. Lam’s understated stage persona contrasted the two sisters. Though seated in one of the back rows, I could see pained intensity painted on her face. She gave priority to the musical narratives, moving more dramatically when called for by the music’s emotion or bombast, but she nested tastefully into the ensemble. At the end of the concert, the mostly older, almost sold-out audience wasted no time sitting, when the trio came out for their final applause. As the trio’s playing was so generous and flawless, their stage mannerisms were not ultimately alienating, especially considering the pleasures afforded by the off-the-shoulder dresses of bright metallic pink, moss green, and silver-grey.